Tested a bunch of light bulbs this month, buying a sample of each. I'm reporting my light bulb discoveries here for the benefit of other artists -- as well for art collectors and interior designers who want to display art. I was searching mainly for full-spectrum bulbs to light my painting area. Both LED bulbs and compact fluorescent bulbs are cooler than halogen, important to me in Georgia's hot summers. Top choice: BlueMax CFL, 26 watts (150-watt) equiv. After some painstaking work (that was also fun) I settled on 26-watt BlueMax compact fluorescent (CFL) bulbs for the easel and table painting areas. These bulbs have a color temperature rating of 5500 Kelvin (K), a nice white light that's blue enough to be like natural sunlight mid-day, but still pleasant. 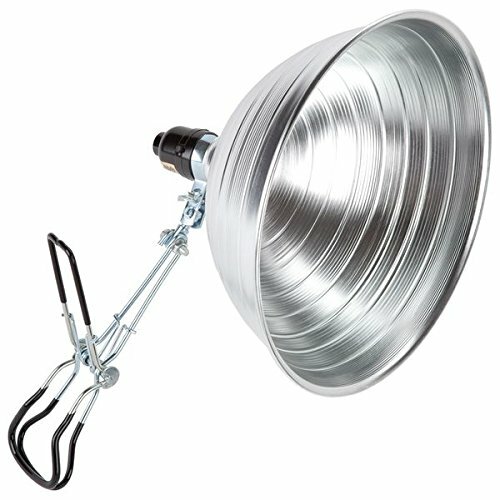 The 26-watt BlueMax bulbs are advertised as equivalent to a 150-watt incandescent bulb, plenty bright enough for lighting an easel. (I'm actually using four: two on each side.) 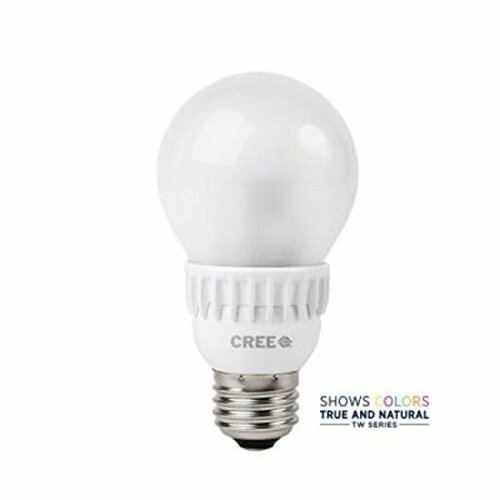 These bulbs have an outstanding Color Rendering Index (CRI) rating of 93, very high indeed for a compact fluorescent. My own non-professional tests confirm that among bulbs that fit regular light fixtures, this bulb is an excellent choice for judging color. Photo © Full Spectrum Solutions. Click to go to site. For use in a fixture rated for 100 watts, BlueMax makes the 23-watt CFL -- also 5500 K -- that carries a slightly lower CRI rating of 90 -- still quite good for a compact fluorescent. My testing in PhotoShop, using RAW images of color charts photographed under one bulb at a time, showed only the slightest difference in color rendering. This bulb is under 4.5 inches long, so it fits easily into most light fixtures. 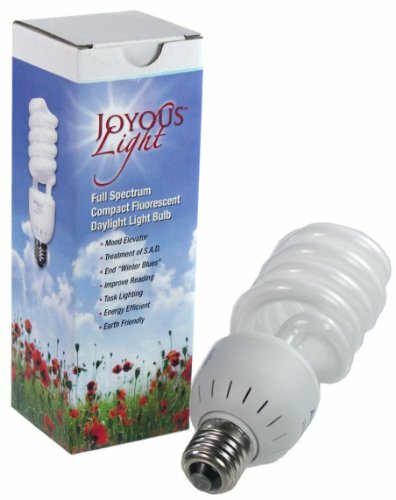 The 27-watt Alzo Joyous Color bulb is the same nice 5500 K temperature, with a CRI of 91. Its main drawback is its 6.5-inch length, which makes it protrude just enough from most light fixtures to create some glare. I'd still judge these bulbs certainly acceptable for artwork. I like them better than the 32-watt 6500 K bulbs by the Daylight Company, often marketed as great for artists. The Daylight Company bulbs carry a CRI rating of only 85, barely acceptable in my book. At 5.5 inches long, their short length is their main advantage over the Alzo bulbs. There are lots of full-spectrum CFL bulbs that I didn't buy to test. The 23-watt Verilux 5500 K CFL bulbs have a CRI rating of only 85, not suitable (in my opinion) for lighting artwork. 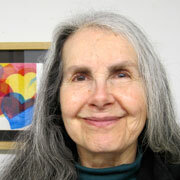 An artist reviewing bulbs at Amazon.com gives top marks to the 25-watt Ott-Lite 25ED12R, noting its CRI rating of 90+. The color temperature is rated at 5800 K, a bit cooler than the BlueMax bulbs I like. Price looks good. The same Amazon review also provides specs for quite a few other CFL bulbs. With my budget, I don't want to try them all! Note that fluorescent bulbs do emit some ultra-violet rays -- so they're not ideal for displaying artwork. I'm using my new CFLs for lighting the painting area, but not for lighting finished paintings hanging on the wall. I wrote a bit about how I tested in a section below, but haven't summarized my color-fidelity results for each bulb in this post. It's lengthy as it is. If I get enough inquiries about specific results and more detail on how I tested, I'll write another post with more technical info. It's important for me to look at paintings in progress under different lighting, since no artificial light matches natural daylight exactly. This is partly from the bulb's Kelvin rating (how yellow or blue the light). This can make a finished painting's colors warmer or cooler than I really intended. It's also from the spikes and "valleys" in the bulb's light spectrum. Some bulbs make red look a little dull, which would lead me to choose a red that's really brighter than I wanted. When painting under CFL bulbs (even with a CRI rating of 90 or above), usually the blues are a bit redder than in mid-day sunlight -- and reds bluer, yellow greener. Pastel colors may be harder to distinguish. The CRI rating is usually based on matching only 8 colors (using a spectrometer and intricate calculations), while a painter is interested in many more variations. So I used a color chart designed for calibrating scanners as one of my test photos, along with photos and test patches that Modern Postcard sent me several years ago. I don't see much point in checking a painting under "regular" CFL bulbs that aren't full-spectrum, because the viewer's choice will be unpredictable. I know the colors won't look quite right under regular CFLs (that aren't full-spectrum) but there's nothing I can do about that. I found three full-spectrum LED bulbs in the medium-base A-shape that fits my regular light fixtures, and bought two to test. You can see a comparison of the Cree True-White (TW) with the GE Reveal LED at CNET. I like both for lighting finished paintings on the wall, for ambient lighting, and even for reading and writing. The warm light (2700 K) isn't an absolute deal killer when it comes to painting; I find halogen light (3000 K) quite nice as long as I check work in progress also under natural daylight. In summertime, though, the bulbs are just too hot to use except on cool mornings. The main problem for using the available full-spectrum LED bulbs for studio lighting is that they're not very bright. They're barely as bright as a 60-watt incandescent. The 13-watt Cree TW is rated at just 800 lumens, about half the lumens of an old-fashioned 100-watt incandescent. The 11-watt GE Reveal LED bulb is even dimmer, at 570-680 lumens. This variation is from GE; I don't know why it's put this way. One advantage of LED bulbs to keep in mind is that my tests with an inexpensive Gauss Meter show that although the bulb emits a very high electromagnetic field (EMF), it drops off sharply in the first few inches to what I consider a reasonably safe level. (This is my personal choice; Many would argue that there's insufficient evidence of health hazards from EMFs.) I am happy to use an LED bulb in a swing-arm drafting light at a table, while I prefer to keep a compact fluorescent bulb at least two feet away from my head. Note that if you buy from any "Buy on Amazon" links in this post, I get a small compensation of a few cents. I hope you find these links more a convenience than a bother. There are some other bulbs I didn't test because I felt I'd spent enough on sample bulbs. The EcoSmart Bright White LED is available at Home Depot in two-packs. Light Bulb Tests at Popular Mechanics rated its CRI at 90, very good for an LED bulb. Like the Cree TW bulb I'm using, this EcoSmart bulb is rated at 800 lumens, as .At 3000 K, the light is a nice bright white like that of a halogen bulb. If I need more LED bulbs and can get to Home Depot without a special trip, I may try these. The 9-watt GreenCreative CRIsp is warmer at 2700 K, but the CRI rating is higher at 92. It's rated at 800 lumens. One light bulb is expensive at $15.98 (at the time I'm writing) but this includes free shipping. I'm using mainly clip-on lights (with ten-inch reflectors) since they're inexpensive and the cabin has plenty of built-in shelves and exposed rafters. I'm now a big fan of the Bayco SL-311B4 clip-on lights, with big 10.5-inch reflectors a bit deeper than most. They're sturdy, easy to assemble, clip and adjust, and include a switch. They're rated for up to 200 watts -- which turns out to be important even for compact fluorescent bulbs that use far fewer watts. I'm also using two Smith-Victor Thrifty photo light stands with 10-inch reflectors. I bought these years ago to use while photographing my forged iron and mixed-media bowls. These are wonderful light fixtures -- adjustable in height (go plenty tall while remaining stable) and angle. The reflectors are deep and designed for long-neck bulbs, so I use medium-to-medium-base socket adapters to bring the CFL bulbs out a bit. I couldn't find these socket extenders in local stores either, so I ordered from Amazon again. You might also be interested in my 2014 tests of some full-spectrum lamps from the Daylight Company and from BlueMax. These lamps are designed for use at drafting tables and desks. I am publishing, as I really thought I'd published that report last year, but just discovered it among my drafts. Will publish later this week and add a link here. 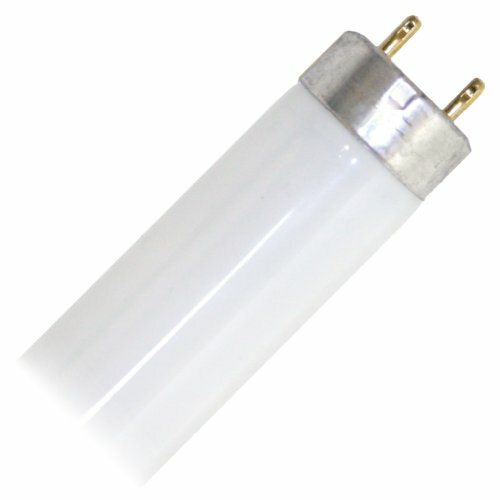 Note that for "Studio 2" that's in the works, I plan to use Philips F32T8 TL950 full-spectrum T8 fluorescent tubes. Even now I have one tiny room in the cabin lit with the very best bulbs I tested. These carry an amazing CRI rating of 98, with a color temperature of 5000 Kelvin. This is cool enough to be "daylight" but not that depressing blue light that very cool fluorescent bulbs often cast. If by any chance your studio is already equipped with T8 tubes, this would be your best bet by far. If my existing room lit with these bulbs were big enough, and the ceiling were taller (to minimize the EMF at my head), I'd just paint there. The photos I checked were right on target with the color charts, so I ended up comparing the other bulbs to the Philips F32T8 TL950. I only needed four so I ordered from Amazon.com, but they're available from many retailers, usually by the case but sometimes individually. Case lots will be less per bulb. As noted earlier, fluorescent bulbs emit UV rays, so if you want to display artwork more or less permanently under fluorescent tubes, it would be worth investing in plastic shields that filter out most of those rays. The BlueMax bulbs I rate highest are available from FullSpectrumSolutions.com. The Daylight Company bulbs I've bought from DickBlick.com. The Alzo bulbs are available from AlzoDigital.com, which also carries some accessories and light fixtures that accommodate the longer length. If saving on shipping costs is your priority, you can also order the Alzo bulbs from Amazon.com -- especially useful if you are an Amazon Prime member. I do get a tiny compensation when you order from Amazon.com, but not from any other retailer or manufacturer. I recommend ordering the BlueMax bulbs from FullSpectrumSolutions as the best bulbs for studio use. You can also buy the Alzo bulbs in a four-pack. Remember though that the 6.5-inch length may be a problem. If you'd like the spreadsheet with more details on each bulb I tested, it's titled "Full Spectrum Lighting for Studio Art Work" -- available at Google Docs. I put the light bulbs in descending order of average brightness (light cast 24 inches away, by my own tests) because brightness matters in lighting a large painting. You should be able to sort columns, at least if you export the spreadsheet into your own software. If you want more details or access to the RAW or developed photos, let me know. I can go into much more detail and share the images if anyone is interested. Someone more expert might see subtle differences that I missed.